Plan vacation or business trip with eTravel.com and take advantage of cheap rates on flights booking, airline tickets, and lowest airfares for New York. 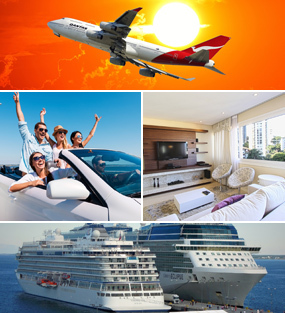 Search cheap flights to New York, find and book single or multi-city destination flights. On this page we give you information and glimpse of visiting places in New York, New York, United States. New York City is a city of dreams that has it all. You will find cultural arts, music, drama, dance, classical art, famous history museums, parks, monuments and stunning architecture right here in the city. In the city that never sleeps you will find nightlife like none other. Everything is fabulous in the Big Apple, the capital city of high end fashion and the elite. What is the Best Time to New York City? There is no bad time to come to New York City. The hotel prices are real steep during the time extending from September to November. But if you book your hotel tickets during the month of November you could take advantage of some awesome deals on hotel prices. The temperature drops and the weather becomes cold during the winter months from December to February. The Holiday season in New York is quite expensive but you can get cheaply priced hotel rooms in late January or early February. How to Save When on a New York City? First and foremost when in New York, do what all New Yorkers do. Take the subway! It is the cheapest and fastest way of getting around the city. Walk the rest of the way or catch a bus. It should help you save. For a quick bite or an entire meal, hit the streets. Some of the best food trucks can be found in New York City and their meals come at an extremely low cost. Look up all the free attractions in the city before looking into the one with an entry fee. Also book your flight tickets during the slack season, when prices are low and things are affordable.